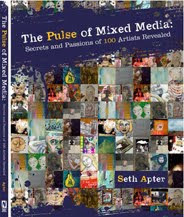 THE PULSE OF MIXED MEDIA: Secrets and Passions of 100 Artists Revealed by Seth Apter has ARRIVED! Through a series of questions that Seth Apter asked artists, artists revealed their thoughts, insights and confessions. They shared ideas, secrets and frustrations. 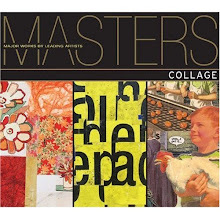 This book reveals their artistic souls, hence the pulse of mixed media. The book is available at Barnes & Noble and the link to Amazon.com is here. One of the tasks Seth asked artists was to create a self portrait. Below is Seth's self portrait in the book. When I look at Seth's self portrait... one of the words that come to me is BUSY. 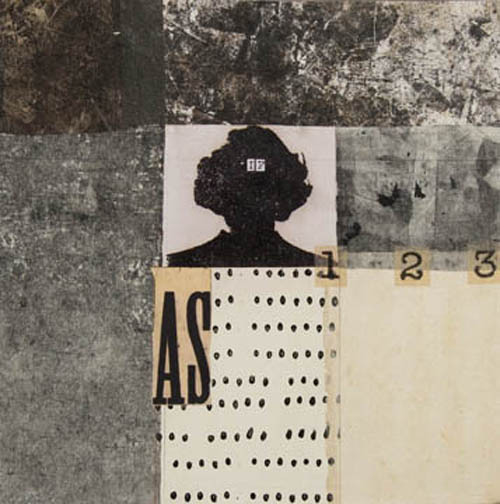 Seth Apter is a mixed media artist in New York City who works in collage, book arts and assemblage. But Seth also has a day job as a psychologist. So he divides his time between his professional office, his studio and his computer office. His work has been published in numerous books, magazines as well as his blog, THE ALTERED PAGE found here, and his online zine, THE PULSE. So Seth is very busy juggling so many aspects of his life and art and I for one am extremely impressed. Below are some glimpses into his studio. 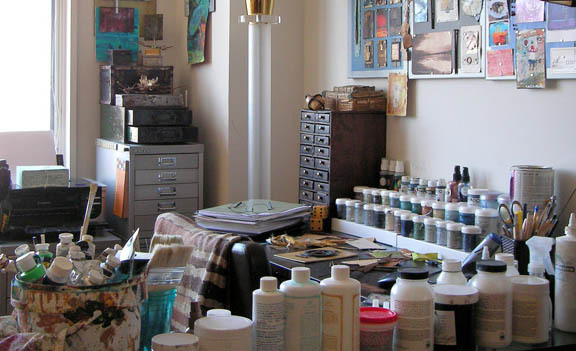 As I look at part of Seth's studio above with that word, I know that Seth approaches his art, his world of art, and his life with a resounding YES. I have been fortunate to be included in this book. 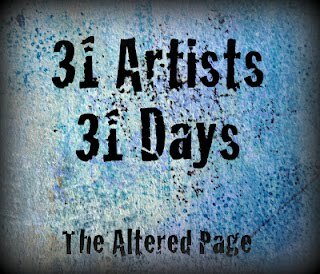 Seth is highlighting 31 artists from the book for the month of March. Today, March 4th is my day and if you go to this link at Seth Apter's blog THE ALTERED PAGE here, you will see what he has written. Below is the self portrait I created for Seth's book. I think a self portrait can reveal a lot about an artist, especially for themselves. My self portrait does not have my actual image. I used a 'blank' head instead, which could be anyone. This is because I am still trying to figure out who I am. I am on this inner journey, seeking balance in my art and in my life. 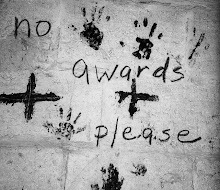 I am also a private person who may not want to reveal too much. There is a mystery. 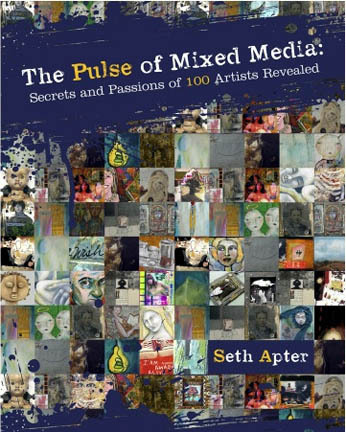 If you go to Seth Apter's blog THE ALTERED PAGE and leave a comment your name will be put into a drawing for a free copy of his book THE PULSE OF MIXED MEDIA. He is giving away 3 copies and you can leave a comment every day for the month of March. 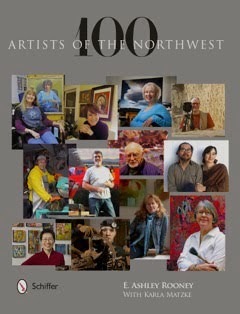 Plus you will get to see his posts on 31 artists who are featured in the book. blog here. Admire your work. 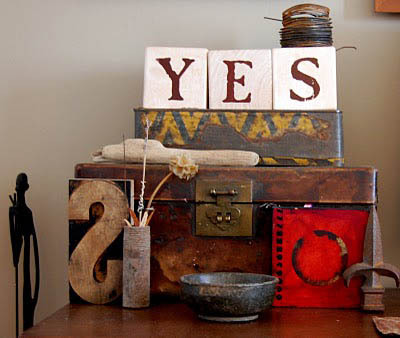 I was actually first introduced to it by Misty Mawn when I took her online class. And now thru Seth. Love the self portrait. Donna, what a lovely post. I enjoyed the peek into your philosophy in addition to the insights by Seth as he wrangled all the resources together for his book. 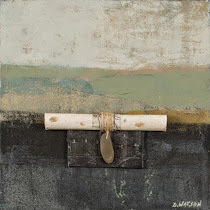 I love his observance that while there are many distinctive differences between artists, there are also strong connective threads too. How interesting that you both incorporated silhouette heads for the self-portaits. A perfect example of different/same. and thank you for every comment you leaving me ...it means very much to me. 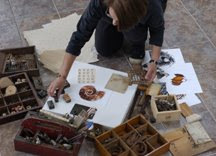 Your work and blog are visual poetry to me - mysterious and all knowing. 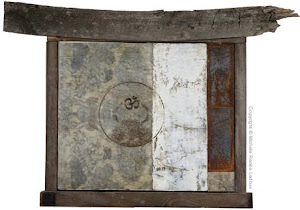 Congrats on being in the Pulse of Mixed Media - and of course congrats to Seth - how does he do all that he does? He's such a fabulous community builder! lovely post, as always. love the thoughtful comments about self and your art. heading over to check things out at Seth's. Great self portrait! 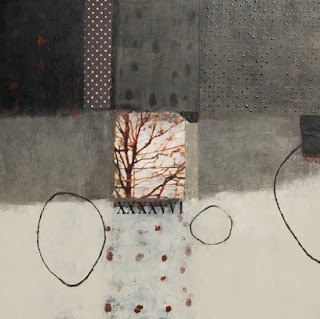 Beautiful work of yours in this post Donna and your new collage in the side bar of your blog. 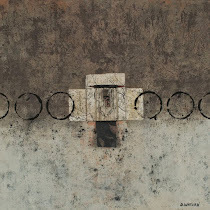 I am pulled in by the order, the apparently simplicity and then rewarded with the subtle complexity. Congratulations to you and to Seth. Who but Seth could have pulled together such a diverse group of artist and connected all the "dots"? Donna, I've been looking forward to your post! Great to see Seth's self portrait followed by your own two pieces. Can't believe you have your book already. I hope South African postal services don't take too long to deliver mine. Beautifully done as usual, Donna. Congratulations on a lovely post and being included in Seth's amazing book. looking forward to the book. though its jarring to see that cover/those colors on your blog - a shock to the system. not necessariloy a bad thing, just a shock. what a wonderful wonderful post, donna! i am so excited to see some of your work that is in seth's book and to read a bit of your responses. i cannot wait to have this book in my hot little hands! thank you, too, for sharing about seth. it seems that as these 31 days progress, we're not just learning about other wonderful artists but more about him as well. so much fun! What a beautiful post Donna, with revelations about Seth and yourself. Love to see both of your self-portraits. 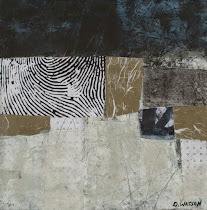 Especially like your response to the question- if your artwork could talk, what would it say-"Be still. Be quiet, tranquil and balanced where places in your heart and mind are found, and where the moment is present, and then past memories come. 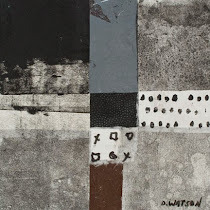 dw" Donna- you're so poetic, thoughful, graceful and so expressive with the connection between art and heart! 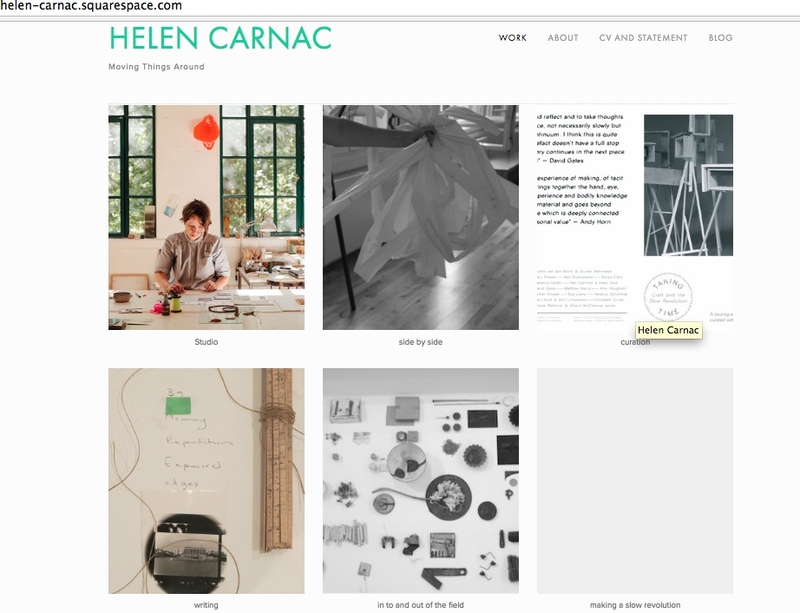 Just love your art and your blog! Donna, as ever it is a pleasure to read your thoughts on "whats New". When seth first mentioned pre order I did! I had no idea my favorite artists would be in the cast! I am anxious to see your part and read your responses to his questions!I am happy you all are in such good company! 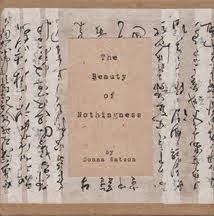 Thanks to Seth I have found your beautiful blog. Your art is so peaceful and inspiring. Congratulations on being in Seth's book. Seth has introduced me to creativity in a whole new way. Stopping, silence, seeing... Thanks! Donna, I wrote earlier this morning, but I see my comment didn't appear. I love your words, about yourself and your art on Seth's post, always your art and garden, and your words about Seth. You are beautiful in your garden. Hi Donna- your work has always spoken to me and your words resonate- "Be still. Be quiet, tranquil and balanced where places in your heart and mind are found, and where the moment is present, and then past memories come." yes, yes, and yes. the book sounds interesting, now i wonder if he met all the artists that are in the book online. Congratulations on being in your book. I love your self-portrait and all the meanings behind the blank head. on ne comprend jamais, qui on est..
plaire ou ne pas plaire..faire ou ne rien faire.. il faut avancer pour soi- même et ici je trouve des réponses..superbe! a blissful and inspiring post Donna...the parallels between the two self portraits are interesting. 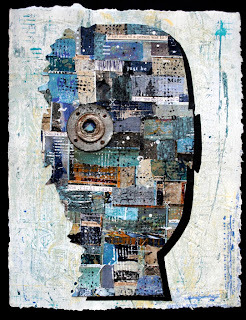 I like that your self portrait is not revealing and leaves much up to the viewer...a philosophy I share as well. Looking forward to receiving my copies of the book soon! the colors and the spaces and the balance of the elements really has a calming affect. so happy to see that you were featured today and in the book. i have just that much more of the window open into you thoughts and process. congratulations for the quality and the work. Congrats on being included in Seth's book. Your work has a very calm and serene feeling to it. I so love your aesthetic and am very glad that Seth brought your work to my attention! Isn't he fab? Dots. excellent! 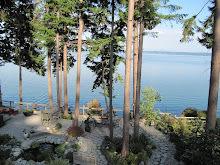 Thanks for this post Donna and for selecting and sharing the photos that you did. The contrasts and similarities of our self portraits is fascinating. Thrilled that you are part of the book. Congratulations Donna! I admire your calm. Love your work. I'm jealous of you view from your studio! 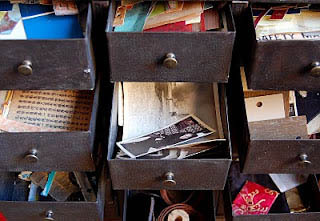 You have a fantastic blog and very, very interesting pieces of art that you highlight. I agree that your art is calm and soothing, both in spirit and in color palette. I love your aesthetic and glad that I have the opportunity to 'meet' you through Seth's blog. I'll be checking in! And thanks for the glimpse into Seth's life. Wow You are a part of this book. and i love Your self portrait and Your words about it. donna, have to switch browsers to respond to yr blog now due to the robot thing not showing up on my browser so it takes longer for me to get to the comments. lovely that you are included in this interesting book. you are so talented. you seem so grounded in things asian, from your gardens, to home decor, that i was surprised you felt you didnt know who you were. Or whatever you said exactly, i cant scrollback to see. I have long enjoyed and found inspiration in your beautiful work. What a treat this has been to get to know you in the book and the pages here. Our words are very similar - peaceful, calm, tranquil, harmonious. Congrats on the second book in which your work has been included! I am thrilled to be a part of this project, whatever form it may take. Congratulations on being a featured artist! your art says that indeed. 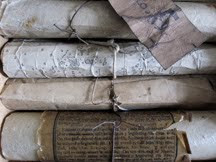 Quietly and calmly, it must travel from the deep quiet places within you to the paper.. 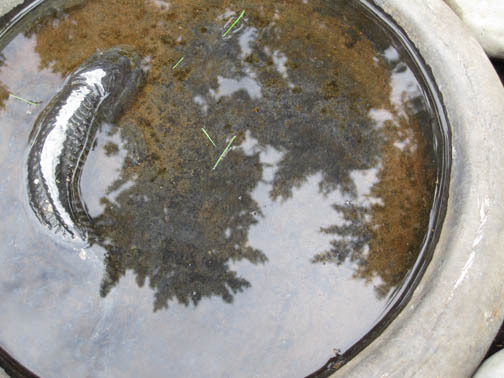 Such a clear channel you are. I learned something new about Seth, as I didn't know he was a psychologist also! I love your self portrait and your explanation Donna...how wonderful to be included in the book! Gorgeous and beautiful share of both your feelings about Seth and the terrific weaving of artists and their lives that he so consistently brings to the community on-line and also to your stunning 'reveal' of your 'portrait of self as a work in progress'...it's an honor to come here to Layers to feel your stillness. Donna, my copy of this book arrived today. Very exciting!! I am going to pour over this book so many times and I am so pleased your art is in it too. I love your layers! Amazing work. Thanks for sharing your art with us and congrats on being part of Seth's book!